Food and festivals are inseparable in Malaysia. Every occasion is a perfect excuse to feast and fete family and friends at the table. 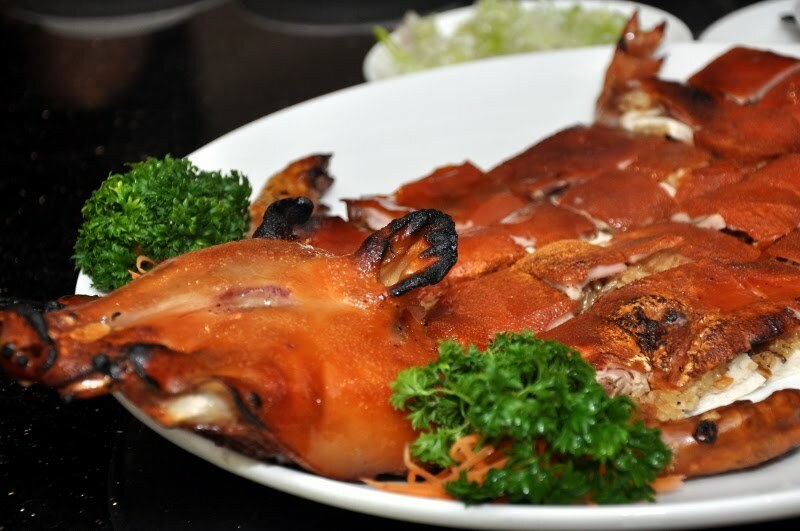 With the Year of the Rabbit just around the corner, Chinese New Year feasts are already being served at major restaurants and hotels around town. But how does a menu that costs RM7688 taste like? Thanks to Sidney Kan of Big Boys Oven who managed to wrangle an invitation for me, I found myself sitting down to a luxurious lunch of that epic price! At the Ritz Carlton's Li Yen and in the hallowed company of Dato' Jimmy Choo and Datin, and his protege, Fion no less! 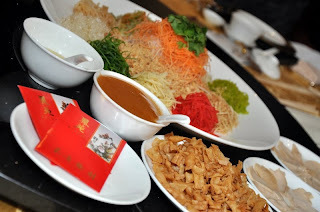 After a warm welcome by PR Exec Oliver Ellerton, lunch got off to a rousing start as we picked up our pair of oversized chopsticks to loh hei (stir up) the dish of Prosperity Sliced Abalone Yee Sang - that ubiquitous rainbow-coloured platter which has come to herald all things good and prosperous for us Chinese in conjunction with the Lunar New Year. 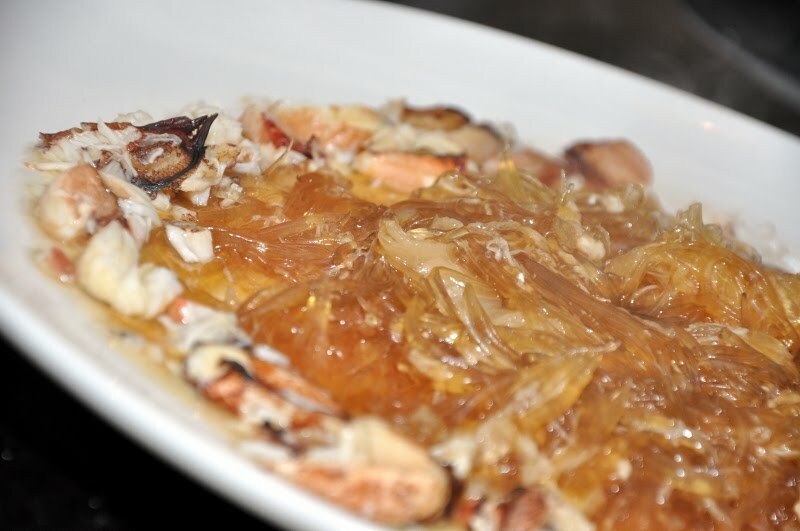 According to Chef Leung, the saucy concoction to complement Li Yen's Yee Sang consists of peach jam, plum sauce and lemon juice while an array of fresh and pickled vegetable, fruits and other condiments are finely shredded to form the multi-hued palette. 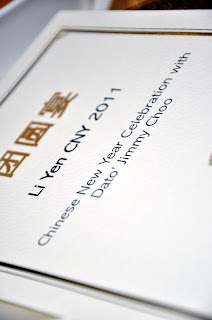 Earlier Dato' Jimmy commented how much he was looking forward to the lunch and that Malaysia's Chinese food is on par with that of Hong Kong. When asked what are his favourite festive dishes, Dato' picked roast pork, fah kau (fish maw) and sea cucumber. He said, "My Dad was a fantastic cook. As an apprentice, he has to cook for everyone at work. I recall one of his speciality dishes was sea cucumber." 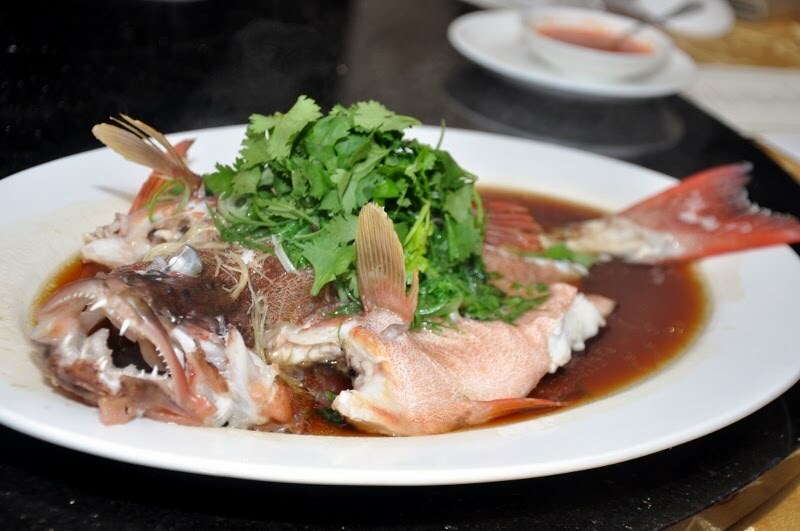 It was a novel experience to savour the Stir-fried Superior Shark's Fin with Crab Meat. 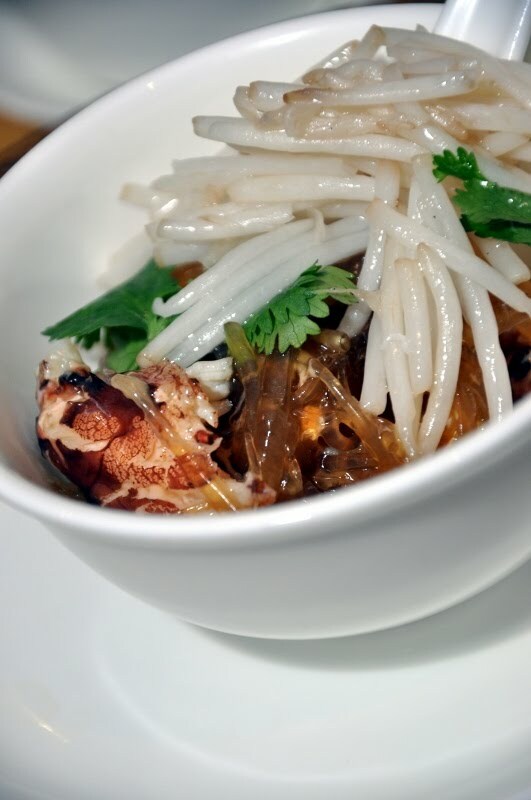 This is one instance where you can relish the glistening, golden needles of shark's fin with plump crab meat and crunchy beansprouts separately from the superior broth or partake everything together in one traditional soupy concoction. Regardless of which ever option you decide on, the chef advocates a little brandy to be added to the delicacy for a fuller, headier taste dimension. I love my shark's fin laced with brandy - flambe if possible! 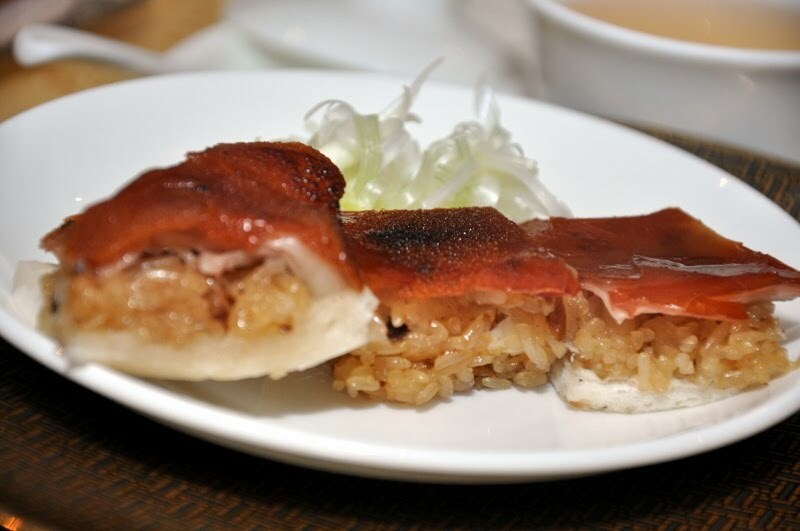 Take a momeent to appreciate the Barbecued Crispy Suckling Pig Stuffed with Glutinous Rice before you sink your teeth into it. This is one delicacy that's a joy to eat but definitely a pain to prepare. According to Chef Leung, it took the combined efforts of the Dim Sum, BBQ and Hot Kitchen teams to ensure this dish turned out well. Instead of just a layer of crisp, crackling pig skin, you'd be treated to a multi-layered textural mouthful that combines rich crispiness with the tender stickiness of steamed glutinous rice and a thin layer of cottony soft pau (steamed wheat dumpling) skin. Superb! 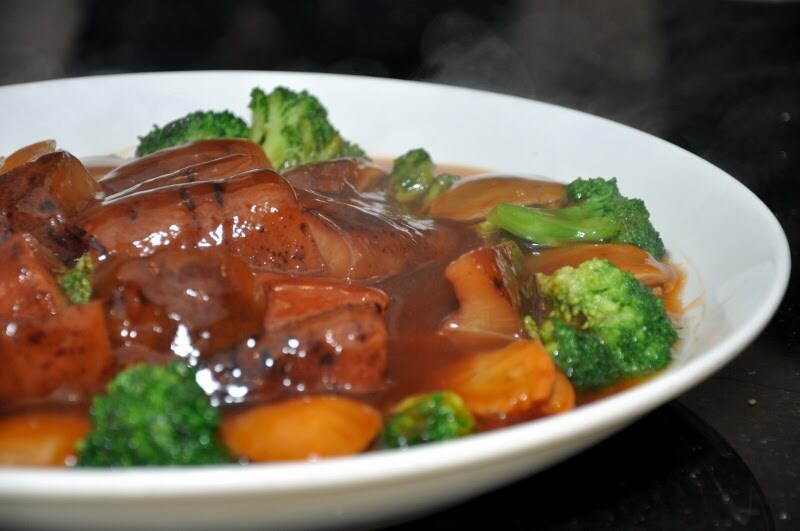 Braised Abalone with Sea Cucumber is a classic dish that finds much favour during the CNY period as hoi sum denotes 'happiness' and pau yue means 'smooth progress guaranteed' in Cantonese. Since the ingredients are horrendously costly, both Phoenix Bee and I were naturally appalled at the sight of any leftover of these two premium items! The inherent sweetness of the Steamed Areolate Coral Grouper with Superior Soya Sauce was apparent once we sampled its delicately soft and snow-white flesh. While the fish hailed from the Aussie deep sea, the large king of shellfish for Baked Lobster with Supreme Stock came from somewhere closer to home - Sabah, Malaysia's very own seafood paradise. 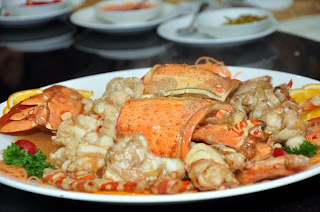 Now the dish's description is somewhat of a misnomer as the lobster was actually stir-fried over high heat rather than baked. It's a tricky process that requires careful handling or else the shellfish would turn out tough and rubbery once overcooked. One rustic offering that I'd always associate with CNY at home is Steamed Claypot Rice with Chinese Waxed Meat. Of course, our home-style version is cooked using a regular rice cooker but the result is just as pleasing. 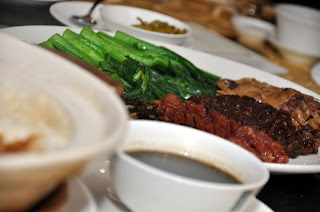 Li Yen's was definitely more indulgent with waxed meat and liver sausages, waxed duck and waxed pork slices thrown into the equation. Hearty and simple, one can easily eat bowlfuls of it ... especially with a dollop of sambal belacan! 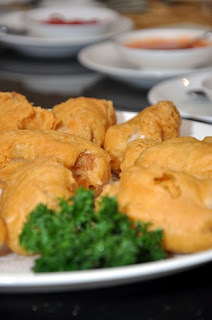 Bringing the curtains down on our meal was Deep-fried Nian Gao with Yam, another perennial CNY delight of deep-fried sticky brown glutinous rice cake sandwiched with yam slices in batter that is designed to sweeten one's Spring Festival celebration and heighten good prospects be it for studies or business. Well, I for one am certainly keeping my fingers crossed for everything good to hop in with the Year of the Bunny! 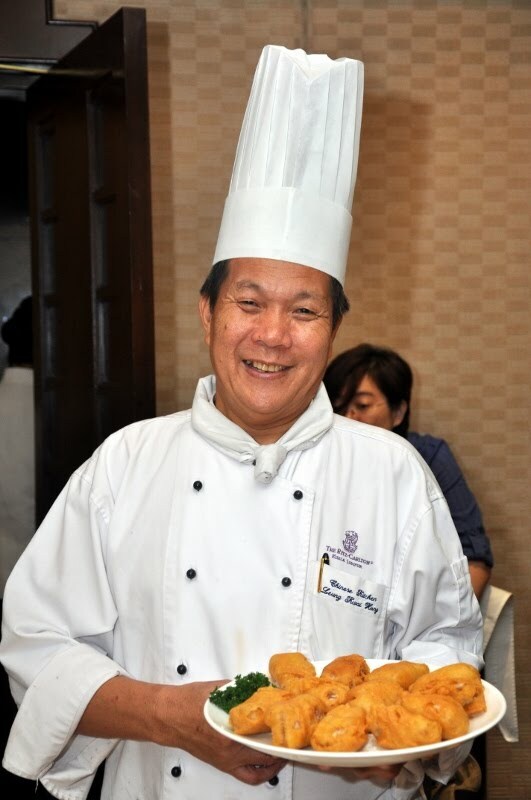 For reservations, call LI YEN, The Ritz-Carlton Kuala Lumpur, tel: 03- 2142 8000. 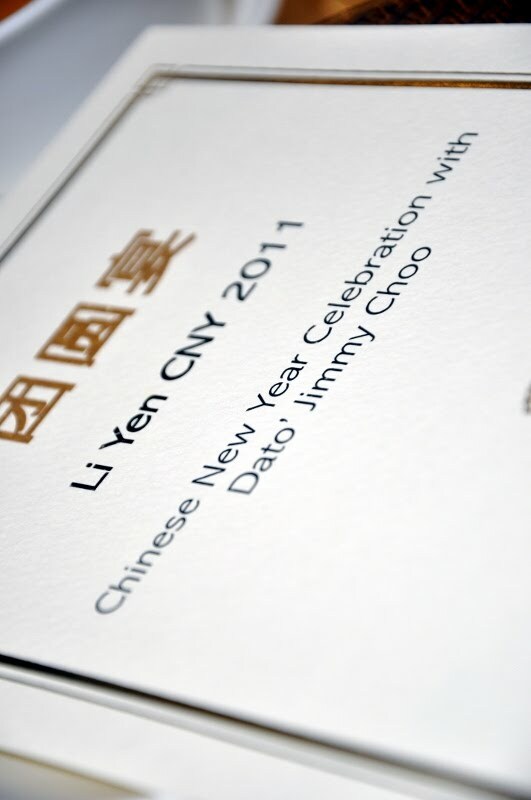 RM7,688 and Datuk Jimmy Choo = priceless moment. Happy New Year dear! Hope things are well with you and the hubby. Catch up one day.